You can barely turn a corner in Atlanta this time of year without seeing yet another beautiful Azalea...they're everywhere! And in more colors than you might think. Azaleas are one of the most popular flowering shrubs in the state of Georgia. 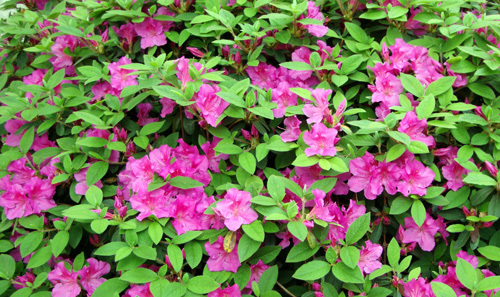 But while most people associate them with spring, like I do, but the varieties are so diverse that you can find Azaleas that will bloom for eight months of the year. I've mentioned before my fondness for the orange Azalea blossom, which I first saw at Callaway Gardens in Pine Mountain, Georgia, on their 1.6 miles Azalea Trail. Since then (that was more than 20 years ago), I've seen orange Azaleas several times in Atlanta, but sightings of that particular species remain quite rare. Not so rare are Azaleas in general, including species that are indigenous to Georgia.